If you’re wondering what the next MLS expansion franchise will be, this week’s Pic of the Week may very well give you a snapshot of what it will look like. 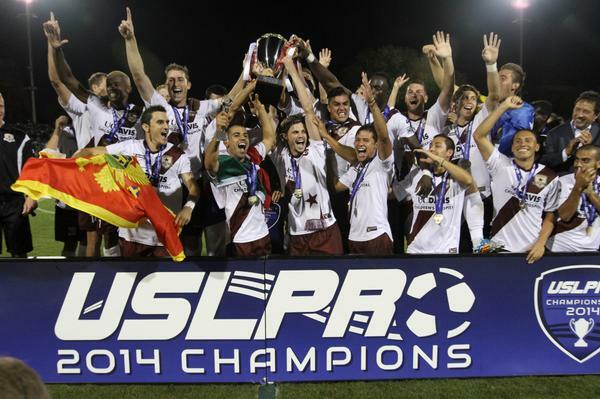 Just in the first year of existence in the American third-tier USL PRO, Sacramento Republic FC are easily one of the biggest successes of the 2014 soccer calendar year. They were one of the most well-supported sides in the country — not just in the minor leagues — by pulling in over combined 158,000 fans in their home matches this season, smashing the USL season record with five matches to spare. And their off field success was easily matched by their on field efforts, too. SacRepublic not only finished second in the regular season standings, but they also barnstormed all the way to hoisting the championship trophy under the guidance of legendary MLS stalwart Preki. That championship run included an incredible come from behind victory over LA Galaxy II in the semis and a comprehensive 2-0 win over Harrisburg City Islanders in the final in front of yet another sold out Bonney Stadium. And thanks to those achievements, it’s certainly justified MLS and the Sacramento ownership playing footsie for most of the 2014 campaign. How soon that will happen is anyone’s guess, but if they can put together another season like this one in 2015, my guess is it will be sooner rather than later that NoCal pops up in the American first division.